For a hypothesis to become a theory, researchers must demonstrate that the idea really works. During the 1960s, geologists found that the sea-ﬂoor spreading hypothesis successfully explains several previously bafﬂing observations. 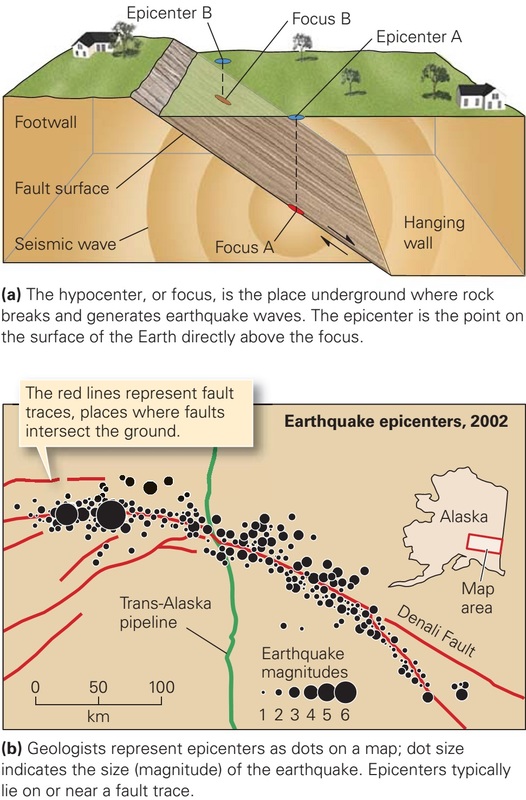 Here we discuss two: (1) the existence of orderly variations in the strength of the measured magnetic ﬁeld over the sea ﬂoor, producing a pattern of stripes called marine magnetic anomalies; and (2) the variation in sediment thickness on the ocean crust, as measured by drilling. Geologists can measure the strength of Earth’s magnetic ﬁeld with an instrument called a magnetometer. At any given location on the surface of the Earth, the magnetic ﬁeld that you measure includes two parts: one produced by the main dipole of the Earth generated by circulation of molten iron in the outer core, and another produced by the magnetism of near-surface rock. A magnetic anomaly is the difference between the expected strength of the Earth’s main dipole ﬁeld at a certain location and the actual measured strength of the magnetic ﬁeld at that location. Places where the ﬁeld strength is stronger than expected are positive anomalies, and places where the ﬁeld strength is weaker than expected are negative anomalies. Bathymetry of mid-ocean ridges and abyssal plains. Military needs during World War II gave a boost to sea-ﬂoor exploration, for as submarine ﬂeets grew, navies required detailed information about bathymetry, or depth variations. The invention of echo sounding (sonar) permitted such information to be gathered quickly. Echo sounding works on the same principle that a bat uses to navigate and ﬁnd insects. A sound pulse emitted from a ship travels down through the water, bounces off the sea ﬂoor, and returns up as an echo through the water to a receiver on the ship. Since sound waves travel at a known velocity, the time between the sound emission and the echo detection indicates the distance between the ship and the sea ﬂoor. (Recall that velocity distance/time, so distance velocity s time.) As the ship travels, observers can obtain a continuous record of the depth of the sea ﬂoor. The resulting cross section showing depth plotted against location is called a bathymetric proﬁle (figure above a, b). By cruising back and forth across the ocean many times, investigators obtained a series of bathymetric proﬁles and from these constructed maps of the sea ﬂoor. 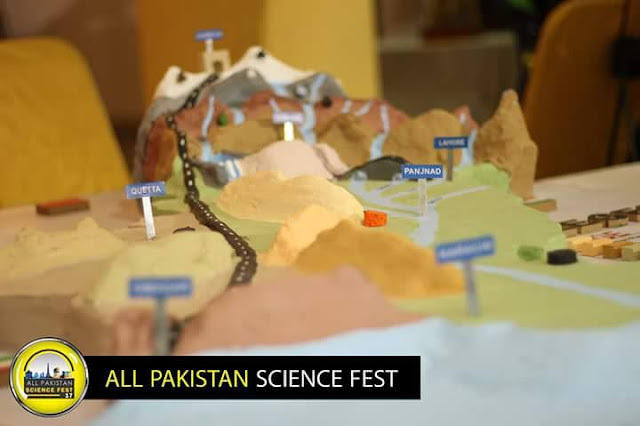 (Geologists can now produce such maps much more rapidly using satellite data.) Bathymetric maps reveal several important features. More than 1,500 years ago, Chinese sailors discovered that a piece of lodestone, when suspended from a thread, points in a northerly direction and can help guide a voyage. Lodestone exhibits this behaviour because it consists of magnetite, an iron rich mineral that, like a compass needle, aligns with Earth’s magnetic ﬁeld lines. 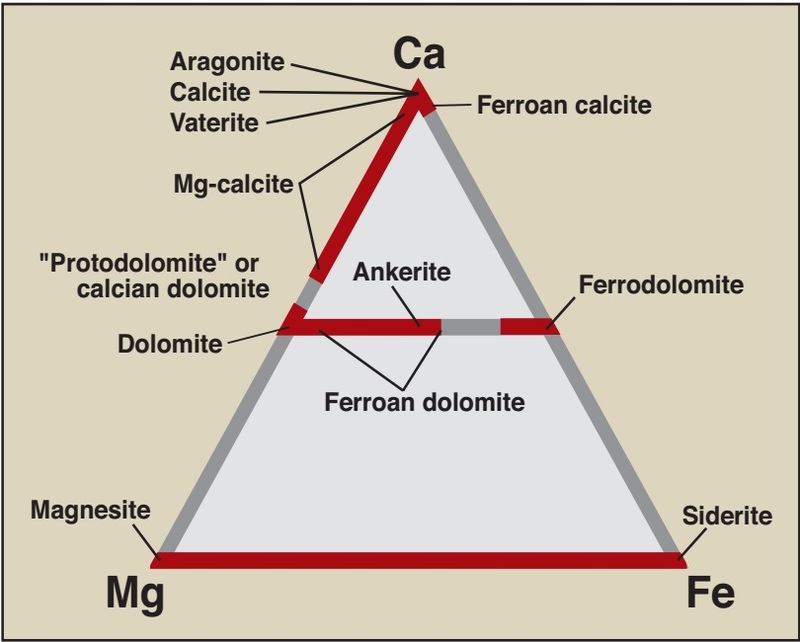 While not as magnetic as lodestone, several other rock types contain tiny crystals of magnetite, or other magnetic minerals, and thus behave overall like weak magnets. In this section, we explain how the study of such magnetic behaviour led to the realization that rocks preserve paleomagnetism, a record of Earth’s magnetic ﬁeld in the past. 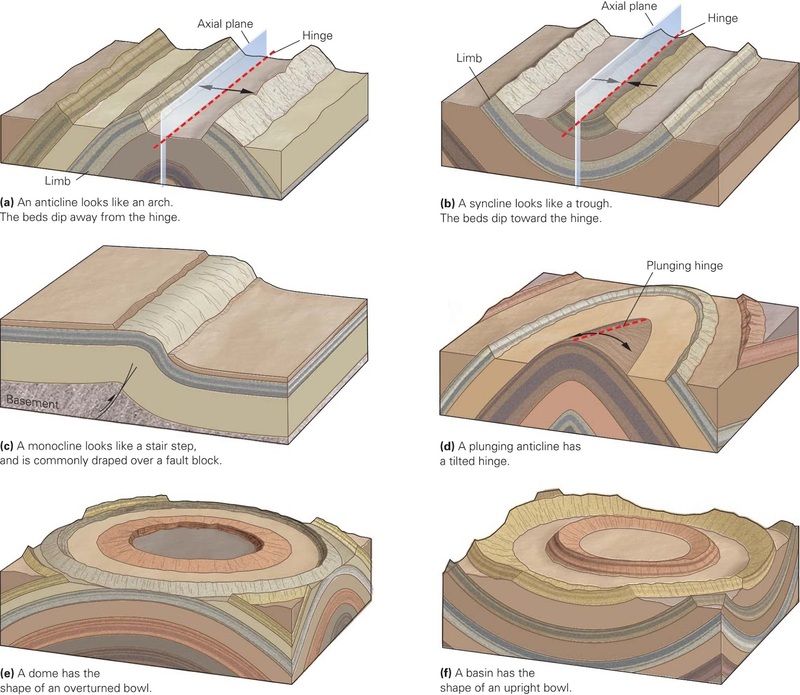 An understanding of paleomagnetism provided proof of continental drift and, contributed to the development of plate tectonics theory. As a foundation for introducing paleomagnetism, we ﬁrst provide additional detail about the basic nature of the Earth’s magnetic ﬁeld. 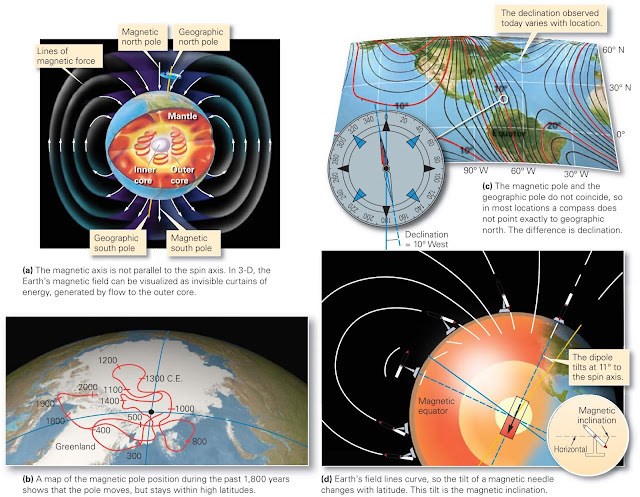 Features of Earth’s magnetic field. Circulation of liquid iron alloy in the outer core of the Earth generates a magnetic ﬁeld. (A similar phenomenon happens in an electrical dynamo at a power plant.) Earth’s magnetic ﬁeld resembles the ﬁeld produced by a bar magnet, in that it has two ends of opposite polarity. Thus, we can represent Earth’s ﬁeld by a magnetic dipole, an imaginary arrow (figure above a). Earth’s dipole intersects the surface of the planet at two points, known as the magnetic poles. By convention, the north magnetic pole is at the end of the Earth nearest the north geographic pole (the point where the northern end of the spin axis intersects the surface). The north-seeking (red) end of a compass needle points to the north magnetic pole. Wegener suggested that a vast supercontinent, Pangaea, existed until near the end of the Mesozoic Era (the interval of geologic time that lasted from 251 to 65 million years ago). He suggested that Pangaea then broke apart, and the landmasses moved away from each other to form the continents we see today. Let’s look at some of Wegener’s arguments and see what led him to formulate this hypothesis of continental drift. Almost as soon as maps of the Atlantic coastlines became available in the 1500s, scholars noticed the ﬁt of the continents. The northwestern coast of Africa could tuck in against the eastern coast of North America, and the bulge of eastern South America could nestle cozily into the indentation of southwestern Africa. Australia, Antarctica, and India could all connect to the southeast of Africa, while Greenland, Europe, and Asia could pack against the northeastern margin of North America. In fact, all the continents could be joined, with remarkably few overlaps or gaps, to create Pangaea. Wegener concluded that the ﬁt was too good to be coincidence and thus that the continents once did ﬁt together.